James Atkin's Poker Blog children pokerstars Sharkscope UKIPT Team Online? Not a whole lot has occurred since my last update. I did play a couple of live donkaments, including the £1 million guaranteed UKIPT event at Dusk Till Dawn. It was great to see the club so insanely busy with tables everywhere, and it was nice to have a shot at winning £200k. Unfortunately I bust 20 minutes before the end of Day 1A, but it was one of those bust-outs where you can be happy because I felt I played really well, including folding KK correctly on a J963 rainbow board. I managed to avoid the call-because-you-can't-really-fold-even-though-you-know-you're-beat call that I've been known to succumb to before. I also had a really fun (although not soft enough for my liking) opening table and got into some fun battles, and enjoyed chatting to 'Pinchop' who was on my right. 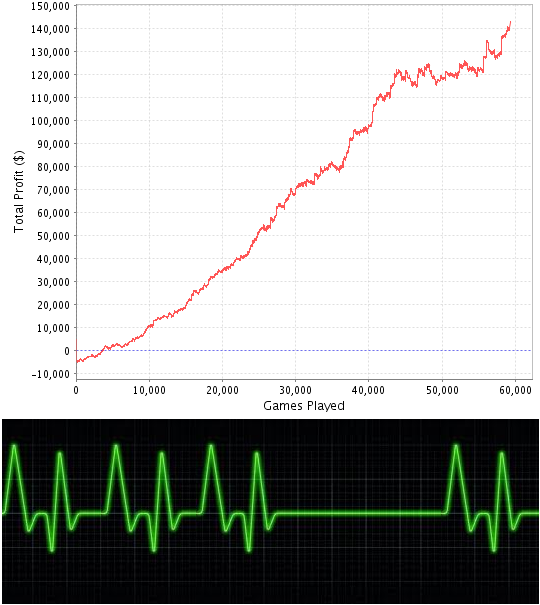 Speaking of online pokerz, I've finally got my Sharkscope graph looking somewhat pretty again. I realise it's a bit of a brag, but after a 12,000 game break-even spell, I think that's okay! I will just be trying to play a decent amount online over the next couple of weeks, and will probably give the £500, £200k Guaranteed tourney at DTD a shot over May Bank Holiday weekend. 5 Comments to "Team Online?" ahh the good old 'call-because-you-can't-really-fold-even-though-you-know-you're-beat call'. I make one of these roughly every 3 minutes in PLO LOL!!! wow that be stretch was some monster! just interested, what overall profit came of that from rb? Good luck with Team PokerStars! I'm not sure exactly Ragz, probably like $5k, maybe a little more. Something like $30k lifetime rakeback I guess. Best of luck with the team online pro thingy. What do you get for that? I guess all your rake back which would be monstrous for you. All the best with the little one. I don't know tbh, they keep it pretty close to their chest and I know it's a stipulation that the guys chosen can't reveal their deal.